Our network of Environmental Leaders spans sectors, geographies and an incredible diversity of lived experiences. The ELP mentorship program is bringing together fellows from each program in the ELP ecosystem to learn from each other and practice collective leadership. 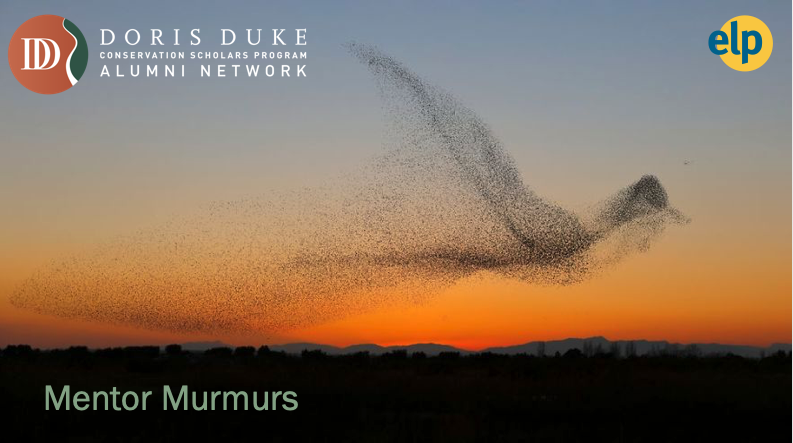 Our Mentor Murmur series aims to inspire new narratives, connections, and murmurations through the lessons and advice of mentors' experiences. Groups or Professional Organizations you are a associated with? What has been the most surprising part of your career journey thus far? What are 1 - 3 books that greatly influenced your life? What advice would you give to a smart, driven recent graduates from underrepresented backgrounds who want to work in the conservation or environmental field? What advice should they ignore? When you feel overwhelmed, burnt out or uninspired, what do you do to personally sustain yourself in this work? Thank you for your submission! You will receive a notification once we post it on our website.